A MUST SEE. This Documentary is winning awards worldwide. "Take Back Your Power" is the ground breaking documentary film that is waking North America up to the dangers of smart meters, cell towers, and wireless technology in all its burgeoning forms! This video take us on a journey of revelation and discovery, as we question corporations’ right to tap our private information, erode our rights, and risk our health in the name of “green”. What you discover will surprise you, unsettle you, and inspire you to challenge the status quo. This newly released (October 2013 and updated 2014) documentary will help you learn what you need to know about the health, safety, privacy and legal rights related to the smart meter programs and other wireless technology being deployed throughout the world. Included in this video are new discoveries from health experts showing how wireless technology such as the smart meter effects our health in basic ways - one example shows it dramatically altering our blood cell function after only two minutes of exposure, or less. 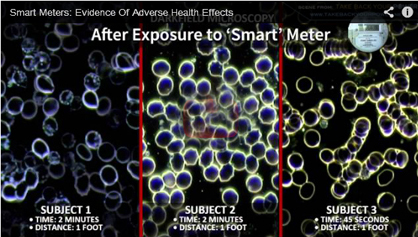 (illustration above is a screen capture of blood cell function being disturbed by smart meters, taken from the video). Wireless Technology - 21st Century Convenience or Plague? Utility companies are replacing electricity, gas and water meters worldwide with new generation “smart” meters at an unprecedented rate. This video documentary investigates the benefits and risks, and the little known downside, of this ubiquitous “smart” grid program, with insight from insiders, expert researchers, politicians, doctors, and concerned communities. Your utility company is counting on you to be complacent. However, as this documentary shows, the stakes are too high. This page dives into hard questions and factual answers that will develop your 1st-hand knowledge and confidence in deciding to protect you and your family.